Ramdoo, I. 2015. 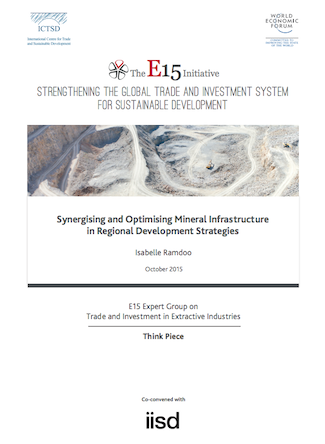 Synergising and optimising mineral infrastructure in regional development strategies. Geneva: The E15 Initiative. The mineral “super cycle” of the past decade, as a result of exceptionally high prices of commodities, has encouraged many mining companies to embark on very large mining projects, including in “frontier” countries once considered too distant or too risky to invest in. Besides weak business environments, institutions, and regulatory frameworks, one of the biggest challenges encountered by mining companies, in particular by “first movers,” is the absence of appropriate or existing infrastructures, especially in transport, energy, and logistics, and the limited track record of engagement in effective partnerships with the public sector to construct such infrastructures. It is widely recognised that poor and insufficient infrastructure provisions are major obstacles to factor mobility, productivity, and competitiveness. Several recent studies have highlighted the extent of current gaps (in physical and financial terms) and have quantified their negative impacts on growth and the business environment in several parts of the developing world. In Africa, the challenge is particularly daunting. To address this, it is estimated that the world will require US$57 trillion in terms of infrastructure investment between 2013 and 2030 to sustain gross domestic product (GDP) growth. This implies that investments will have to increase by almost 60 percent over the next 18 years. In Sub-Saharan Africa (SSA) alone, the World Bank estimates that needs would amount to US$93 billion a year. These figures are probably just an average guess. While they reflect what would be needed to maintain and upgrade existing infrastructures in developed economies and meet the needs of developing countries, they, however, do not take fully into account the broader ambitions and upcoming challenges of emerging economies. Indeed, infrastructure provision is not sufficient in itself. It can only be transformative if it is well connected and integrated into territorial development and if it can contribute to stimulate trade and investment, business development, and maximise the potential of economic sectors. For this reason, infrastructure development that arises from large mining projects provides a unique opportunity for poorly endowed countries to permanently change their state of affairs. To address the general weaknesses in the infrastructure sector and reverse their impact on overall economic development, there is a strong case to be made to leverage, share, and optimise the use of mineral infrastructures for broad-based economic activities. 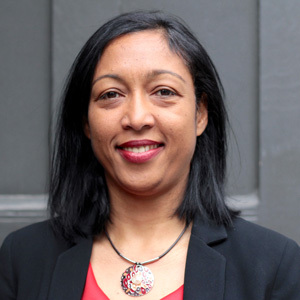 This is not only relevant at the national level, where smart spatial linkages can unlock access to other economic actors and sectors, but also more broadly at the regional level, to better connect markets and improve the movements of goods, services, and people. Countries can derive significant positive externalities from the large economic potential that can be released from wider use of mineral infrastructures. On their side, companies can share their (high) costs and manage capital exposure risks by partnering with governments and other stakeholders to achieve this objective. The purpose of this paper is to explore the potential of mineral infrastructures as “anchors” for economic development and cross-border cooperation. It proposes some policy recommendations to make better use of existing frameworks to foster the utilisation of mineral infrastructures. It also points out that in some cases, rules may not be the most appropriate way to stimulate broader economic development out of resource infrastructures. Sometimes incentives and strategic partnerships are more efficient and effective ways to realise certain objectives. For example, governments need to coordinate their efforts with private sector actors, both from the mining industry and from other economic sectors, to build synergies across economic objectives. Co-locating infrastructures has the potential to create scale economies, address different types of shortages at the same time, and reduce costs.